It seems I have an unusual amount of guilt over not making a priority of writing things down here lately. I went the whole month of November with one solitary post recanting my canning season. November came and went much too quickly, but during that month, I really hit my stride with getting our new family member into a solid routine. I also got quite good at getting supper on the table in a timely fashion, at the same time nearly every evening. Food waste is at an all time low, with meals recycling into the "never-ending meals" that Tamar Adler so adequately wrote a book about. I still hear her voice in my head when I bring a pot of water to a boil, and always make more rice than I need, because it will always find a use. I also seem to have been hearing the term "bearing witness" around quite a bit lately. The notion that our existences depend on others noticing us. In the food writing world, maybe that means that for one split moment we have been first to entice or discover (or more appropriately, rediscover) the next most excellent thing that everyone wants to make, or written the next most beautiful book that seems to be on everyone's shelf... For me, it's the tree falling in the forest phenomenon: if I disappear from the world of this intricately woven Internet fabric, will anyone notice or was I actually ever here at all? If I choose to live in the small moments of the day without much interaction from the web of computer voices, will the people I know forget me? We went out to the farm for Thanksgiving, where we had far too few family members to eat the 17 pound turkey that was raised down the road from my Parents house. The sheer quiet of the land in that part of our state always gets me. In this time of year in particular, when the birds are near silent, and the trees absent of leaves, crispy air hits your vocal chords and there is no echo; it's just quiet and clear. 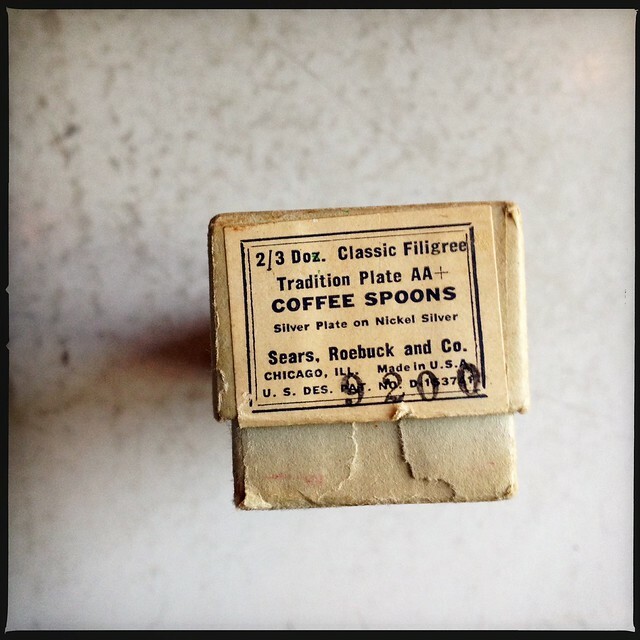 My Mom found a little box of silverware that belonged to my Great-Grandmother, and I found that I couldn't stop thinking about it. 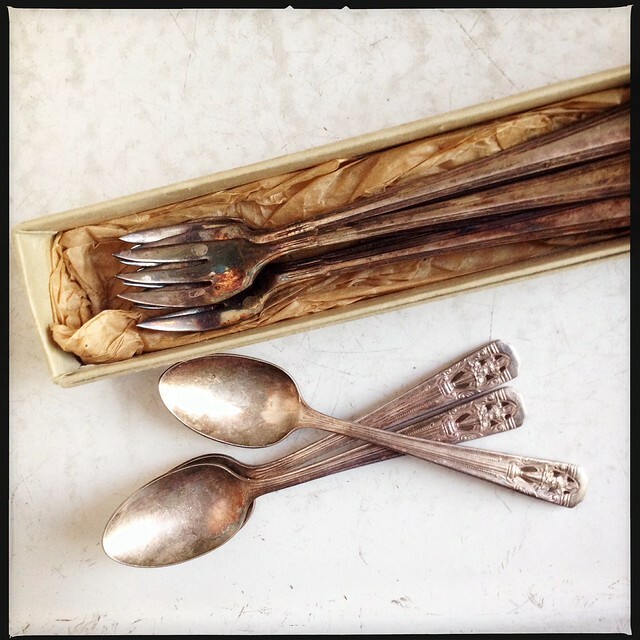 Little silver plated coffee spoons and pickle forks, because people needed such things in the world years ago. I've had my children too late in life for them to know much of their Great-Grandparents, but I grew up in the kitchen of my Nana, some of my most vivid memories of food are her old-country ways of doing things. The way of doing things that is so truly wholesome and handmade it makes anything I do now pale in comparison. I told my Mom how I love my Vitamix so much (she doesn't even have a blender right now) and how I used it to chop everything lickety split for my salsa this year, and in a later conversation she said how she can remember her Grandmother chopping her vegetables for her soup. Chop, chop, chop. In that little northwoods kitchen with no one to see or hear, no one to photograph or bear witness to that supreme act of love she lived out by nourishing other people. Thinking about that on my trip home almost made me want to get rid of my Vitamix. Almost. It takes about 3 hours to drive back to our house on the southside of Milwaukee. When my 7 year old boy was chatting with me in the car about when he moves away from me someday it kind of hit me hard. "Well I hope you won't move too far away, " I said. "I won't." "But you might! You never know." I tried to remember than I have at least 10 years before worrying too much about such things. But that dear boy just said that he wouldn't be far, he'd be in the country. He wants to live rurally, maybe just because I let him play outside unattended there, but I think he really likes it deep down. I am pretty cautious about letting him into too much technology. Most of his classmates talk about things he doesn't have any idea about, video games and iPads and stuff that I just don't want him to concern himself with, in part I think because I wish I never got involved in it myself. But therein lies the double edge: I have met real people that I truly like; I have a part in bearing witness to the lives of others in a real albeit virtual way. But if I choose to watch the little babe try and roll over for too many minutes, if I don't feel like setting up the tripod to capture the tarts or the cupcakes or the non-photogenic foods that sustain us (the turkey carcass now boiling down on the stove that is too large to fit fully in my pot), or if I choose not to poetically conjure my next meal, does that mean I slip hopelessly from the consciousness of others? At least until the new year, I am choosing to not worry too much about it. I want to always remember to live in the small moments of the everyday, not to jump up at the signals of my phone that notify of a text or email or a repost of something that will fade fast into the virtual world without much help from my anyway. I want to remember every second of my little boys before they grow into big men who sometimes have a hard time making it home for Thanksgiving. I'm not disappearing just yet, but maybe just making myself a bit more scarce.